Americans’ view on marijuana have certainly changed a lot over the past twenty years. When I was a young twenty-year-old, smoking weed was still considered extremely taboo—at least in my tiny town in central Minnesota. As far as I was aware, it was hard to get a hold of and if you were caught using it, you were labeled a “pot head” for the rest of your school career. However, as the years have gone by, many medical developments have put marijuana in a different light—mostly with a positive spin. Marijuana legalization, in some form or another, has happened in 30 of the 50 states, and it’s just a matter of time before it’s legal everywhere. The question we need to ask ourselves, however, is whether or not it’s really safe. Especially for developing teenage brains when peer pressure is at its height. Now, as a mother with three teenage boys in her house, and a daughter on her way to double-digits, my husband and I have had to take a closer look at how we discuss the usage of weed. Our oldest son is seventeen and, in all likelihood, he knows of at least one kid in his class who uses—despite it still being illegal in our state. While we have had many open discussions with our kids about drug use of any kind, marijuana is a tougher one to explain why it should be avoided. 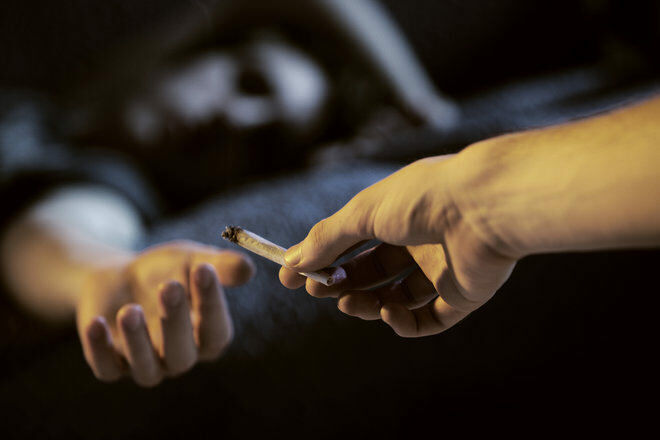 This is, in part, due to the medical benefits that have subsequently been tied to the recreational drug—even if the risks for teens outweigh the benefits. How are Teens Introduced to Marijuana? Like any other substance, most teens don’t fall into marijuana use by accident. It’s introduced to them by family and friends and made socially acceptable by their own use. In fact, a new study suggests teens who have a parent (and in this case, mother) who uses weed are more likely to try it themselves. The average age of a teen who tried marijuana went from 18 to 16, if their mother was known to use pot. As with most things teens are willing to try, being surrounded by those who make marijuana seem normal can lull them into a false sense of security. It’s even likely the adults or peers who use may not even fully understand the risks associated to underage marijuana use and how it affects a developing brain. We’ll dig more into this in the risks section. These days, there are a number of ways pot can be consumed. For teens, the most common comes in the form of inhalation—but others can be readily available, too. It’s important to know how your teen may be ingesting marijuana, if you wish to combat it in any way. Here are the most common ways to take marijuana—whether recreationally, or for medical use. Vaping – Vaping is a huge thing for high school students—and it’s not just because of the fruity flavors, lack of smoke, and nice scents. E-cigarettes are the most widely used tobacco product used by teens in the U.S. Since the advent of e-cigs, roughly 1.7 million high school students are estimated to have used pot in the devices. That’s 1 in 3 who have reported vaping and 1 in 11 high school students total. As a parent, one of the scarier aspects of teen vaping (whether with pot or tobacco) is its ease of overdose. Especially when the concentration for both pot and nicotine is higher in vaping form than any other form of intake. While they may be trendy and even seem like they were made for kids—e-cigs can come with deadly consequences. Smoking – Obviously, weed can be smoked, just like tobacco can. While vaping has shifted much of the teen population over, there are still those who will smoke the dried leaves of the plant. It can be rolled into a cigarette, smoked from a water pipe (bong), in a cigar that’s been hollowed out and refilled with weed, and even sticky resins. Edibles – A growing industry worldwide—baking weed into cookies, brownies, and other edible items is on the rise and especially intriguing to those who would never smoke pot. It can also be infused into teas. CPD (cannabidiol) drinks – The cannabis drinks market is beginning to take off after Coca-Cola has said it’s keeping close tabs on the market’s trends and may be interested in jumping into the game. With the way teenagers chug down energy drinks, this is certainly an area where parents need to be aware and talk to their kids about the potential risks. Even though CPD is the non-psychoactive ingredient in marijuana, too much is still never a good thing. Tincture – Typically used for medical marijuana use, cannabis oil is delivered via tincture under the tongue. This is a faster delivery system for those wishing to lean on its pain-relieving agents. While there are certainly benefits associated with marijuana use in medical circumstances, long-term recreational use can be cause for concern when it comes to developing teenage brains. We’re not just talking poor grades; although that can certainly be a symptom of a much bigger neurological biochemistry problem. Let’s take a closer look. Many of the damage associated with brain disturbances are long-lasting. So, we’re not just talking a couple of days of poor concentration. We’re talking a life-long damage to brain function that alters brain chemistry forever. I don’t know about you, but that’s not something to simply ignore. If you think your teenager may be experimenting with marijuana through vaping, edibles, or something else, now’s the time to open an honest dialogue with them about the potential life-long risks. Even if you’ve experimented in the past—or still use openly because it’s legal where you live, talking about it can mean all the difference in the world. If it’s not legal where you are, explain candidly how a marijuana conviction could derail future plans. While it may not negate their own experimentation all together, it may cause them to view its usage a bit differently. Even if it simply means they think twice before using. Choose a time to talk with your child when you know they’re sober and haven’t used. This will help ensure they’re focused and capable of taking the information in. While it can be frustrating for parents to find out their child is using, try not to be hostile about the confrontation. Hostility will only make your teen retreat and hide their habit even more. Instead, keep communication open, honest, and geared toward motivating them to get clean. If you feel your son or daughter’s drug habit is spiraling out of control, talk to them about getting treatment for drug abuse. While the view of marijuana use is changing around the world, there are still many places where using it—even for medical purposes—is illegal. For teens, though, recreational use can derail future plans and do detrimental harm to their developing brains. Even if you use, it’s best to help steer your teen clear from using as long as possible. You may be surprised just how far an open, honest conversation with your teen will carry you both.